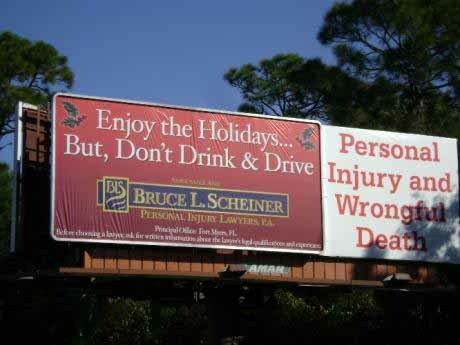 Associates and Bruce L. Scheiner, Personal Injury Lawyers, has again purchased dozens of holiday billboards urging motorists not to Drink and Drive this holiday season in an effort to reduce the number of drunk driving accidents throughout Southwest Florida. “The holidays are a time people seem to drink more than other times of the year and we want to prevent the carnage on our roads,” said Bruce L. Scheiner, founder and senior attorney of Associates and Bruce L. Scheiner, Personal Injury lawyers, which has been representing drunk driving victims throughout Southwest Florida since 1971. Each year the firm purchases the boards in Cape Coral, Fort Myers, Naples, Port Charlotte, Arcadia, Sebring and Venice in an effort to help reduce the number of drunk driving accidents and holiday tragedies endured by drunk driving victims. The statistics are sobering: The Fort Myers- Cape Coral area was recently named the deadliest area its size in the nation for teen drivers between Thanksgiving and New Year’s. Thanksgiving ranks Florida’s deadliest holiday for traffic accidents and is followed quickly by Christmas and New Year’s, a 10-day stretch that is full of travel and celebration that too often leads to senseless tragedy. “We want the public to be aware that drinking and driving is very dangerous and to use designated drivers and take other steps to ensure everyone has a safe holiday season,” Scheiner said. If you or someone you love is in an accident there are certain steps you can take to help protect your rights. 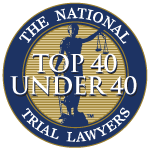 The attorneys of Associates and Bruce L. Scheiner, Personal Injury Lawyers, offer free appointments to discuss your rights and represent drunk driving victims and victims of other types of accidents throughout Southwest Florida.